The hilarious bluffing game that you can’t always believe what you read. Each card lists People, Words, Initials, Movies and Laws that you’ve probably never heard of. But that’s where the fun really begins, because you get to make up an answer that’s as silly or as serious as you want. Players make up phony answers, read them off along with the correct answer, and others vote on which answer is real. You score points for guessing the correct answer or successfully bluffing the other players. Would you believe that in Fairbanks, Alaska, it was illegal to serve beverages to a moose? You better, ’cause it’s true.There are no wrong or right answers! Get as creative or crazy as you want. Convince your friends your answer is correct and score points! Earn bonus points by indentifying the correct answer. 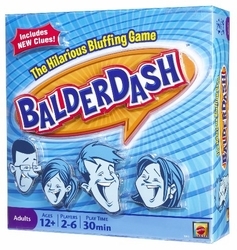 Balderdash will be the life of the party when you hear the hilarious answers your friends come up with!